Robotis has released the successor of the CM-900: the OpenCM 9.04. 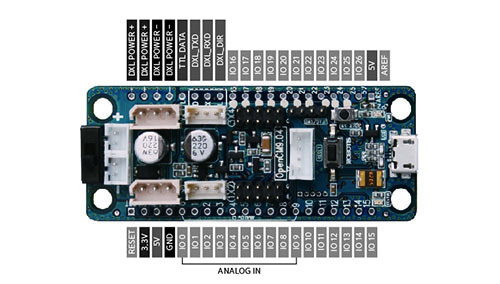 This is an OpenSource controller compatible with 3pin Dynamixel servos and the upcoming Xl series servos. Programming is based on the Arduino language. 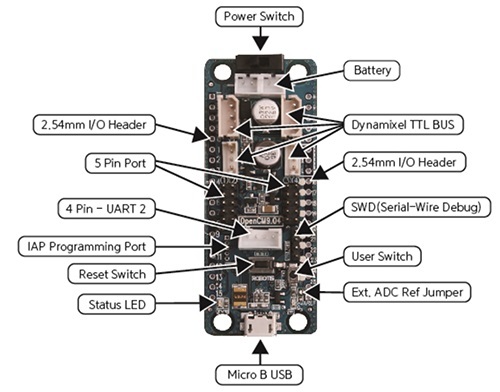 Robotis uses it's own Robotis IDE (that includes all necessary libraries to control Dynamixels) but the processor, design and programming style are largely compatible with Arduino Due design. The board comes in 2 flavours: Type A which is simply the PCB with SMD components (no connectors, switches or headers pre soldered) and Type B which comes with all 3pin connectors pre soldered and switches ready to use. Type B boards also come with headers that users can optionally solder in case they wish to access the additional GPIO pins on the edges of the board. We will soon be receiving a batch OpenCM 9.04B boards. These can already be ordered from our website http://robosavvy.com/store/product_info.php/products_id/4047 and will be delivered in the second week of November.